With a hot sun beating down, 45 degree Celsius heat just outside my front door, last week my thoughts drifted to the beach and how nice it would be to live near the ocean. 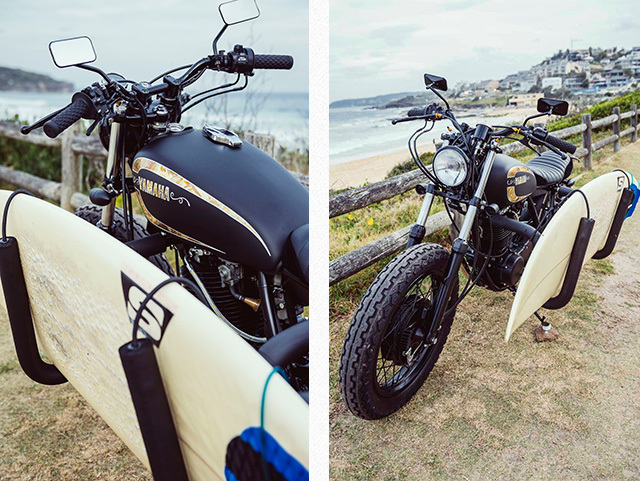 Cool breezes, the sound of waves and a sweet ride to experience it all on. Then this bike appeared in my email inbox. Must be a sign. 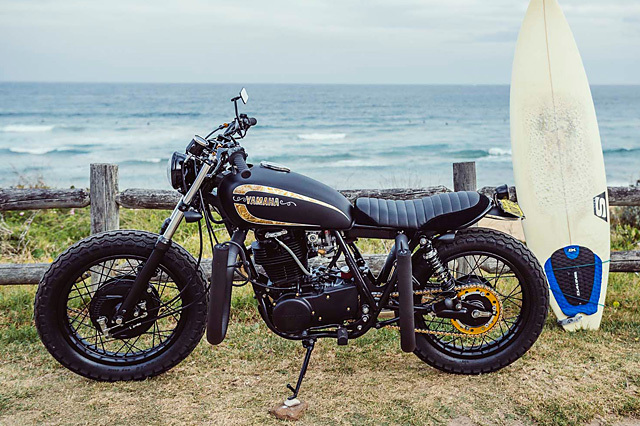 A sweet thumper, built with the surf in mind, this 1985 SR400 has been made over to suit the beach bum lifestyle. With a build brief that appeals to both form and function, this is definitely a bike I would be happy to ride on a sunny day. Or any other day for that matter. 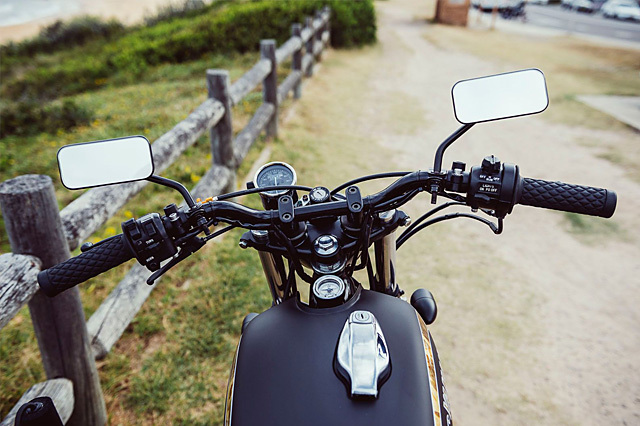 The crew at Addiction Customs had a great base to build from with the SR. Having imported the bike themselves, they knew the condition of the bike at the start of the build which allowed for the perspective to be put on reworking rather than rebuilding the machine. Another bonus was the owner being in no rush to pick up the SR, with the thumper staying at the AC workshop while its owner took a surfing holiday. 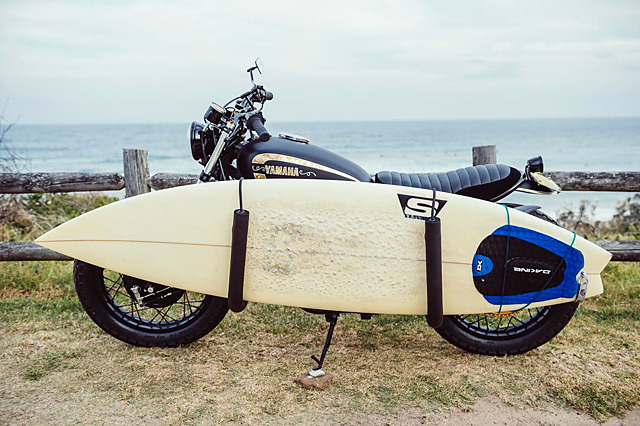 The build brief was simple, the bike needed to be able to carry a surfboard and/or a passenger, based around a matte black paint scheme, and no Firestones. With this in mind, the bike was stripped back to a bare frame. 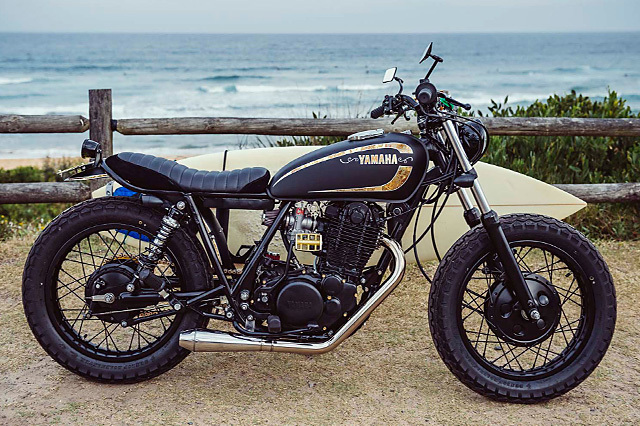 Whilst the Yamaha was naked, the factory rear hoop was removed and an in-house upswept loop grafted onto the frame. Once the custom hoop was on, the builders assessed the mounting points for the surfboard rack. It was decided the surf rack would need to be ‘easily removed, wouldn’t compromise the look of the build and be stealthy in design’. To achieve this, the Internet was scoured for existing bike racks that could modified to suit the aesthetic of the bike. 6mm plates were welded to the front frame gusset, while at the rear an underslung mount was fabricated and fitted up. Once the rack was mounted, the seat pan, fender and indicator mounts were fabricated to suit, and the rest of the frame detabbed. After ensuring everything fitted, it was off to the sandblaster to prepare for the thumper’s new paintjob. 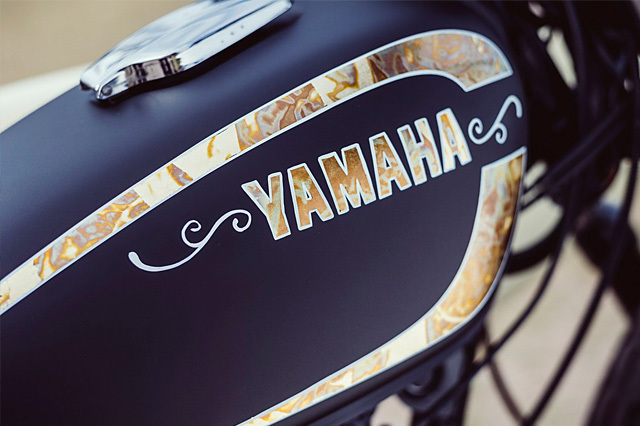 The pristine tank and stainless rear fender were sent to Smith Concepts, the result a simple matte black base emblazoned with the Yamaha logo, detailed in variegated gold leaf and finished with a white pinstripe. Addiction Customs are happy with the finish, describing it as ‘clean and classy’. Once the tank guard were finished, the remaining frame componentry was cleaned up and powdercoated. Frame, swing arm, wheels and hubs all received the powdercoat treatment, giving the dark aesthetic the owner wanted in their ride. To round out the dark side of the build, the engine was prettied up and given a coat of matte black paint. Happy with the SR powerplant itself, there are a few mods that lens themselves to performance. A Keihin CR38 roundslide carb had been fitted, along with a K & N pod and breather. To offset all that black, a stainless reverse cone muffler was polished up and mounted. In addition to this, bling was added in the form of gold engine bolts, sprockets and drive chain. 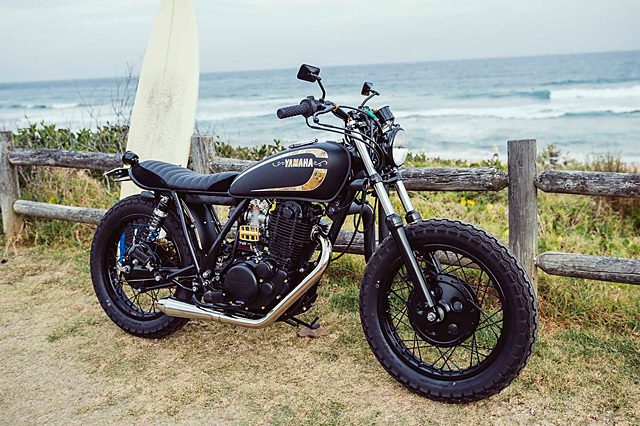 From such a simple build brief, Addiction Customs has managed to build a sweet ride. 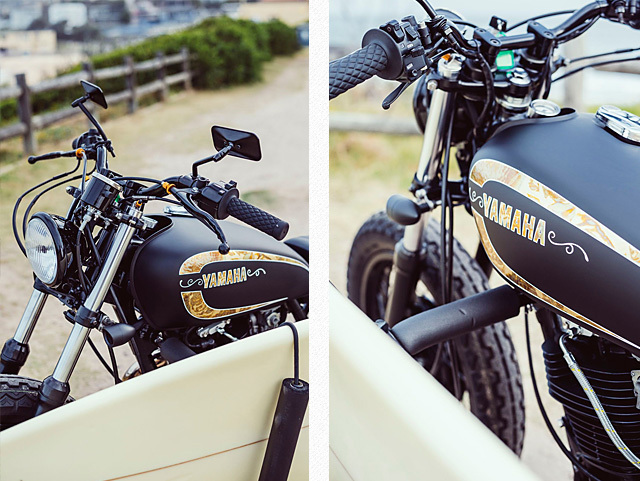 In-house fabrication, and ample time to create the look they wanted, means that the owner of this Yamaha has one of the coolest rides parked up in the beach car park, or anywhere else for that matter.